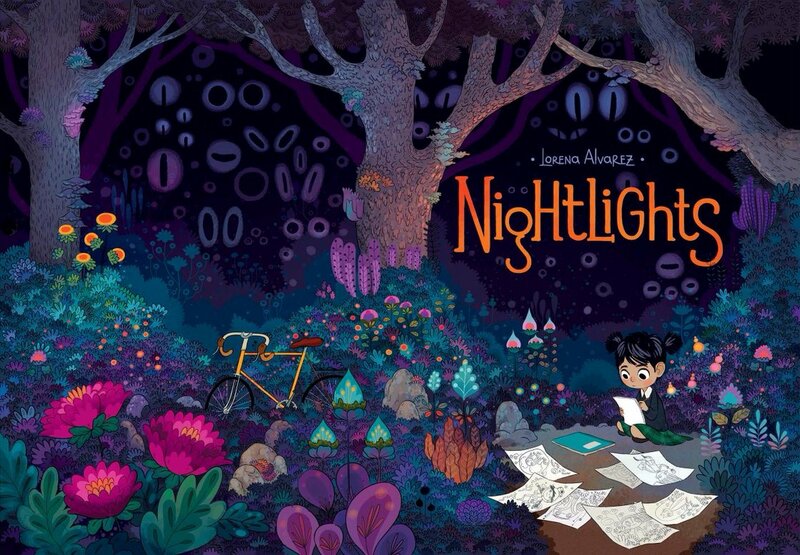 Nightlights by Lorena Alvarez might be one of the most beautiful comic books that I have read in a long time. Nobrow Press clearly saw the potential with this brilliant creator and have published an oversized comic book that does justice to the art within. My breath was taken away time and time again as I was drawn through the story. Sandy is a little girl who loves to draw more than anything else. As Sandy goes to bed, she sees little lights that she turns into her imagination creations that help her fall asleep. Then, one day at school, Sandy meets another little girl who has a strange obsession with her drawings. Who wouldn’t? The panels that show Sandy’s drawings come to life are nothing short of spectacular! The story kind of reminded me a bit of Anya’s Ghost by Vera Brosgol meets a LITTLE bit of The Secret of Kells… definitely more the former than latter. 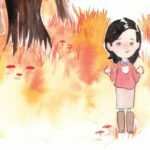 When I saw the little girl that befriends Sandy, I immediately thought of Kells, but as far as tone goes, it’s comparably to Anya’s Ghost but with big, sweeping pages full of colour and imagination (not that Anya’s Ghost isn’t full of imagination). They’re utterly and completely breathtaking and reminiscent of art from any Studio Ghibli film, although maybe moreso Spirited Away in this instance. 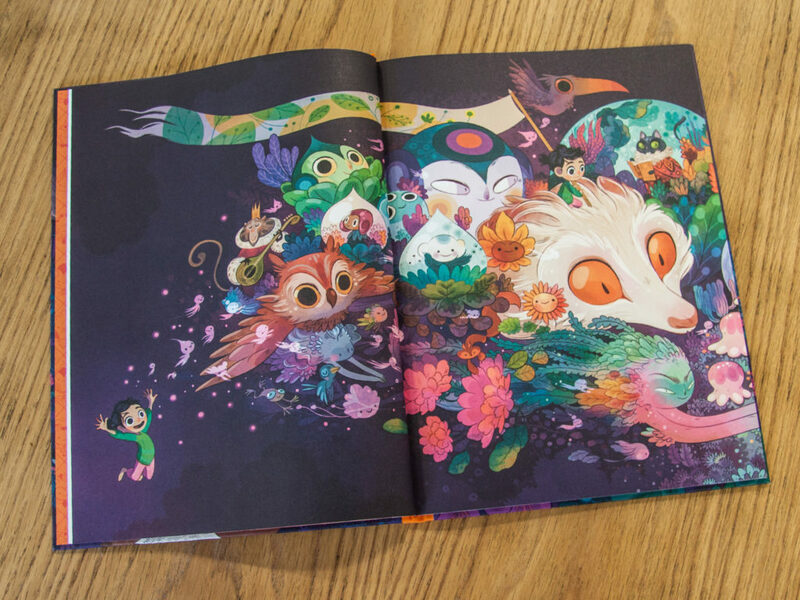 The colour palettes that Alvarez uses to bring the illustrations to life are stunning and vibrant, and her style itself reminds me of the early days of Disney concept art by the likes of Mary Blair. Honestly, there’s not much more that I want to say about the book in terms of the story and such. It’s a fairy tale with a slight kid-friendly horror edge. The story is pretty simple overall, but sometimes you don’t need more than that and it’s incredibly clever how it all comes together. It says something about our fears and how we can second-guess our talents and gifts, by letting insecurity in. Buy. This. Book. This is simply one of the best comics that I’ve read in a very long time. It’s the perfect length, doesn’t fluff up the story more than it needs to, has delightful characters and the art… oh my gosh, the art. Even if the story hadn’t been any good, this book would’ve been worth picking up for the art alone. Thankfully the art and the story are both remarkable, which makes it even MORE worthwhile to pick up. 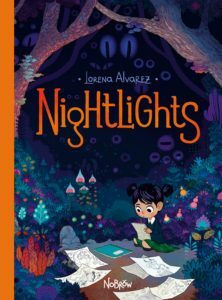 Nightlights will be available on March 14.